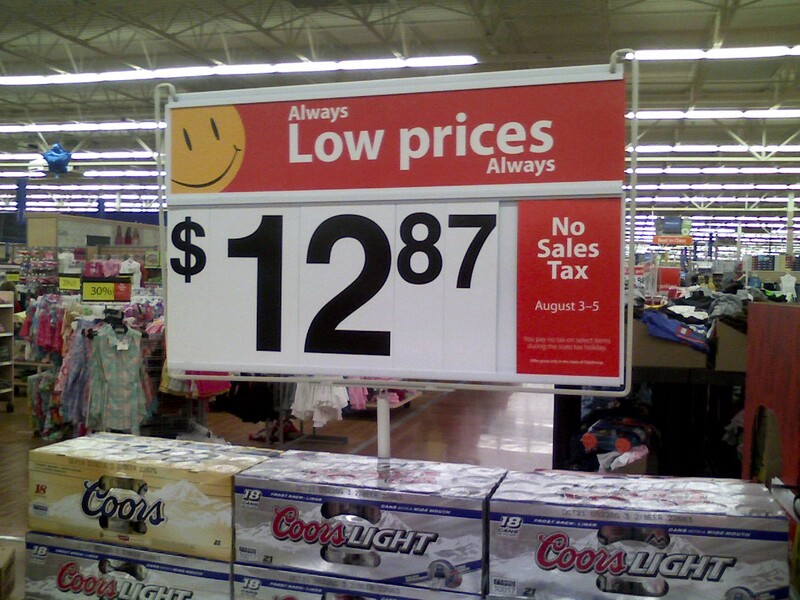 Taken at the Wal-Mart in Edmond, OK. For the record the exemption only applies to clothing. HD-DVD drive now available for under $100? I was recently browsing on eBay and seller gameconsolehk is selling Toshiba SD-S802A HD-DVD drives for Xbox 360 for less than $100 shipped. At first I thought it was a typo or an unscrupulous seller. But I did some research and apparently it is the drive that Microsoft uses in the addon HD-DVD drives for the 360. According to captain_video on the HTPCNews forum, the drive does have a non-standard connector, but you can use a laptop drive adaptor to connect it to the standard drive connector in your PC – IDE I am guessing, but possibly SATA? The drive appears to have special mounts on the sides, but maybe you can take them off to mount the drive in your PC? Aside from this, I couldn’t find a lot more information on this drive aside from eBay listings and a couple of firmware hackers. This seems a bit weird. I find it strange that the seller seems to have no shortage of these (there are several listings), especially at such a low price. Also, if Toshiba can sell these at such a low price, why don’t they sell these at this price to the general PC user market? They would sell like hotcakes! What’s going on here? Do condoms help stop the spread of HIV? Quick quiz: do condoms help stop the spread of HIV? Most (sane) people, even many evangelicals, would probably say “yes,” even if it is from a statistical standpoint. But John McCain doesn’t even know! How dumb can this guy be? I would say that I’m politically moderate, and I did consider the possibility of voting for McCain if he is chosen to run in 2008. But I don’t think I would vote for a guy this dumb! I’m sure that some of you have heard of the American Family Association. For those of you who don’t know, the AFA is a very conservative fundamentalist/evangelical group. The AFA has several million members. The AFA likes to whine a lot. They have been complaining for a while now about how Ford advertises in gay media. For instance, the AFA claimed that Ford explicitly supported gay polygamy because they had an ad in a gay magazine that had an article on the cover regarding this issue. If somebody advertises on a TV show that they don’t like, such as Desperate Housewives, AFA members will be writing letters to advertisers (see OneMillionDads.com), demanding that they pull ads from the show. When something happens on TV that they don’t like (e.g. Janet Jackson Superbowl incident or swear words on TV) you can bet that the FCC’s inboxes will be filled with “cookie-cutter” letters from AFA members. And you can’t forget that the AFA runs massive campaigns every holiday season, threatening to boycott any retailer that does not use the words “Merry Christmas” in their advertising! Apple’s Refurb Store – great discounts on Apple products! Deals on Apple products seem to always be popular, because Apple stuff is almost never on sale. However everyone seems to forget about Apple’s refurbished store where you can get great deals on current-gen as well as previous-gen Apple products! These products all have the same warranties as new products. I’ve ordered from them before and the products are almost always in great cosmetic shape. They run out and restock all the time – if you see something that you want you should probably buy it ASAP, and if you are looking for something that is not in stock, check back every couple of days to see if they have what you want. You can get a current-gen 1GB iPod Shuffle for $59, or a previous-gen one for $49. This is a great deal over the $79 you would pay for one otherwise. 2GB and 4GB current-gen iPod Nanos are $119 and $169 (respectively), taking $30 off of each. 8GB iPod Nanos are $209, meaning that those are $40 off. Previous-gen iPod Nanos can be purchased for an even larger discount – 1GB models are $79, 2GB models are $99, and 4GB models are $129. Current-gen 80GB iPod Videos are available for $299. Those are the only video iPods that are in stock as of this writing. If I recall correctly you could get the previous-gen 30GB models for $179, which is a great deal. Of course they’ve also got great deals on Macs too. The base Core 2 Duo MacBook is available for $949 and the black model is available for $1299. If they restock the Core Duo MacBooks those would be $150-$200 cheaper (the base one was available for $799.) They don’t currently have any good MacBook Pros in stock but those will be 15%-30% off, depending on the model and type of processor. The $999 Core 2 Duo iMac sells for $849 and similar deals are available for other models. A Quad Intel Xeon Mac Pro can be purchased starting at $2199. You can even find old Power Macs and PowerBooks for even greater discounts. In addition you can get refurb Apple accessories, such as displays, keyboards/mice, and AirPort stuff at good discounts as well. TwoTrees Shelterbelt – worst filtering system ever! My school uses a filter called Shelterbelt from a company called TwoTrees Technologies. I have to say – it has to be some of the most unprofessionally designed software that I have ever used. It is March 3, almost two weeks later, and I still have not received a reply from TwoTrees! And of course EFF’s site is still blocked! I thought that Iran was the only place where BoingBoing was blocked, but I guess I’m wrong! “I’m a PC and I’m a Mac” – circa 1996! 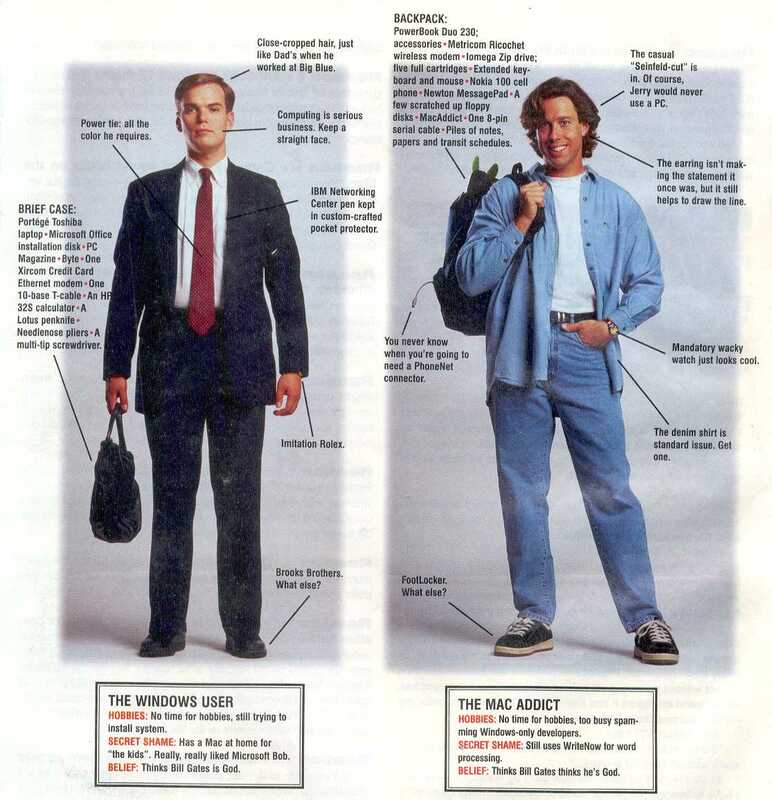 This is a Mac user vs. PC user comparison from the September 1996 issue of MacAddict. (this issue was actually the premiere/first issue of MacAddict) I recently found it when going through some of my old MacAddict magazines. It doesn’t look a lot different from the “I’m a PC and I’m a Mac” Apple ads of today, at least in my opinion! Some people seem to think this was an Apple ad. This was not actually an Apple ad – it was part of a MacAddict article. During this time Apple was really struggling and this particular issue of MacAddict seemed to have a lot of Mac fanboy-ism in it. Pirated/recorded copies vs. legit iTunes copies? For many of us, strict DRM makes it undesirable for us to download music/movies/TV off of paid download services. Steve Jobs recently acknowledged this issue in his open letter to the music industry. However there’s another major issue that the music/film industry is overlooking: the desirability of the products themselves! As this guy pointed out, you can download a XviD HDTV encode of your favorite TV show off of a BitTorrent tracker for free, and it is of far higher quality than the one that you can buy on iTunes. It’s not much harder, either, unless you need to convert it to play on an iPod or other video device. Whenever I miss a TV show, I will usually either download a copy off a torrent tracker or watch a copy recorded on my SageTV PVR. TV shows from these sources don’t have DRM, meaning that I can watch it on whatever device I want, and of course they are higher quality as well. I watch my TV with SageTV or my Zen Vision:M, two things that I could not do if I downloaded TV shows off iTunes. Even though downloading TV shows off BitTorrent is still a gray area, if I want to stay legal, I can still record TV shows off my PVR and stay completely legal. And, of course, it’s the exact same thing for music. First of all there’s the issue with DRM, which everyone knows about. First of all there’s some music that you can’t download on paid download services. An example is how everyone got so excited when there were rumors that Apple would sell Beatles songs on iTunes. It’s ridiculous! And also you can download higher-quality rips off torrent sites than you can download off of iTunes. Most albums can be found in 320 Kbps or VBR MP3, and some can even be found in FLAC lossless format. RIAA/MPAA, you’ve got a long way to go.